So this morning we went to MSI located in Hayward California. Wow it had every possible stone could imagine. We brought along our samples for the doors to new cabinets and our intentions were to purchase a light gray stone counter. We need more greeted by a woman who was interesting character, extremely friendly and great personality. Let's just say P. was awestruck with with this woman. 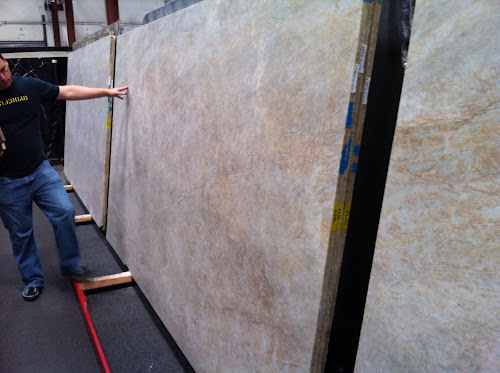 It began her husband large warehouse walking up and down probably about 20 different aisles looking at various stones from quartz to soap stone to granites but we walked fast through the marble section. I'm just not a marble fan. Our intentions was to purchase a stone that was gray in color, preferably not too dark preferably not too light. For some reason we kept coming across green stones that really cried out to us. But we knew that having a color stone would not be a good idea for resale. After looking at hundreds of different stones, our contact started to help us weed through everything that we have just seen. She showed us several different kinds of stones and we decided we wanted a brushed or matte surface. For some reason I'm not a big fan of polished shiny surfaces. She finally showed us three different stones that all had one thing in common. They were all had a green tint to them. The first one was a pretty dark green color, the second was mild in green color. The third stone was more off-white color with green undertones and red veining. We really liked the second stone but they only had one slot left. The main location located in Los Angeles only had that zero left. Which meant that we had to wait at least 2 to 3 weeks for the new stones to arrive. Would've been great about this stone is that it was originally from alarm which I'm sure with a pissed off a few family members on my side of the family. Before we left this morning, I asked clem to take a look at a photo I found online. The kitchen in the photo had dark cabinets but the light cream colored stone counter. So it was interesting that she showed us was a cream color stone green tones and red veining in it. Which would complement not only the cabinets but also the floors. After looking at seven different slabs we ended up choosing three of the slabs, of which we will only use two. Previously I had gone to several stone place is located in Santa Clara at the recommendation of our contractor. What I found was all those stones found in those locations were pretty much was found this one large location at MSI. So for all you future remodelers of kitchens, check out MSI in Hayward first. The staff is friendly, the selection is amazing and well well it's not a place for kids, the staff love kids. So now the plan is to go back and pick out floor tile. Right now we are leaning towards metro stone because we haven't found a porcelain tile that actually meets our expectations. Check back for that blog entry and check back for the cabinet entry coming up later this week. BRIAN H-K August 15, 2012 Dirty Words, What Did You Say?